OK boys, last week I was invited to the GM Heritage Collection in Sterling Heights, Michigan. This is one of about 17 buildings and warehouses that comprise the entire collectionl. The cars here are on constant rotation. So the cars shown are not aways the same. You will notice a large number of Chevys. GM is currently getting ready to celebrate Chevrolet's Centennial, which is officially November 3rd. GM uses this building for special events and VIP receptions. This is not open to the public either. This is the 3rd time I have been there. The first time was in 2007 as part of a special Pontiac-Oakland Club Day. The 2nd time was part of the GM Centennial celebration in 2008. My Lemans was one of the 50 cars that represented Pontiac that day. All the drivers were invited to a celebration after the events at the GM Tech Center. You are now allowed to drool on your own keyboards. Lots of great looking production and concept cars here. 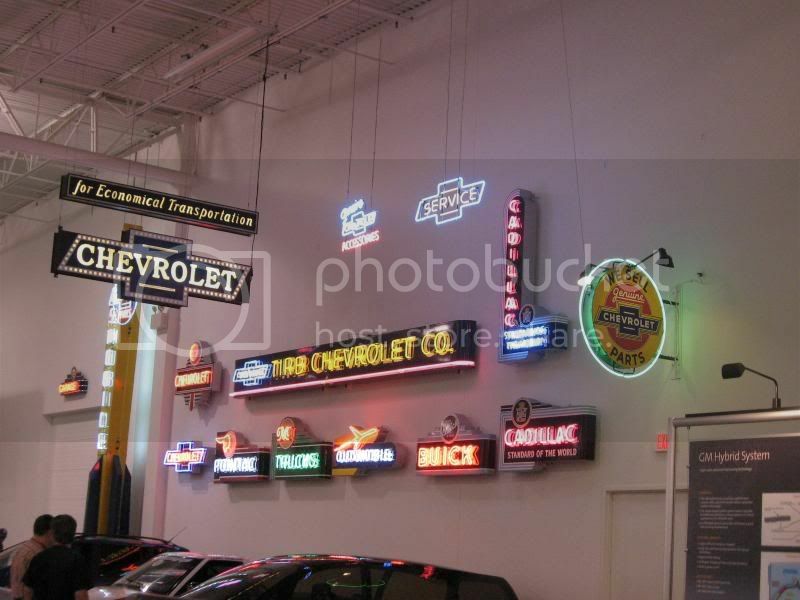 I am only disappointed that I didn't have enough time to photograph more Buicks, and Oldsmobiles and a lot of the other wall displays. Viewed every picture and oh man what I'd give to see each of those in person, those are awesome! LOL!!! Glad you like it. I often wish I could work there! You folks are in luck. 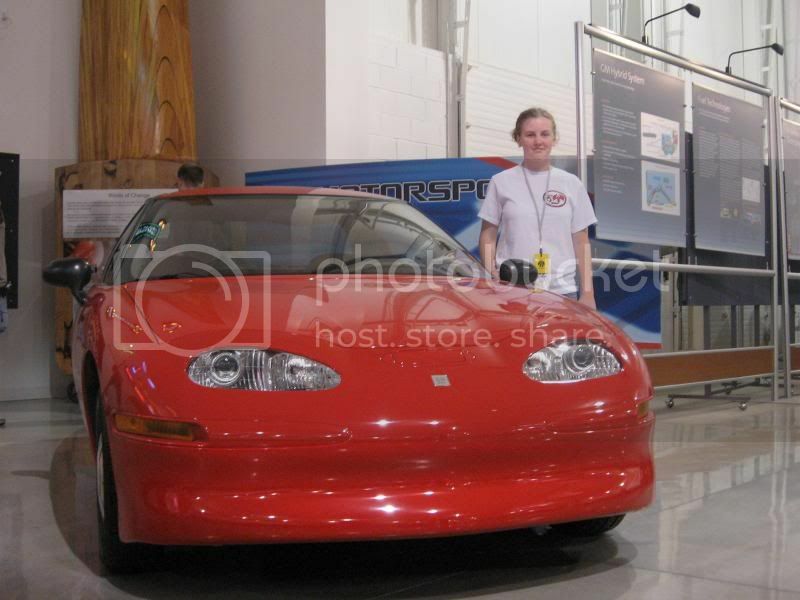 I found my pictures from the 2007 POCI Day at the GM Heritage Center. I took out repeat shots of a lot of the same stuff. The old gentleman in the black hat, shirts, and gray slacks sitting next to me is none other than Malcolm 'Mac' McKeller. Mac died last April. He was Pontiac's foremost engine and cam designer and engineer. He developed the Super Duty, NASCAR, and Ram Air V8 engines. He built the OHC-6 motor at DeLorean's orders so Ponitac would not have to use a Chevy I6 in their base cars. He was truly a legend and a humble man. The man in the white T-shirt and shorts with the cane standing with Mac is my father. Dad is a retired AC Spark Plug / Delco Electronics engineer. Two great men in my book. I love the neon sighs you took pics of. You had two of the same wall and I used my Panorama maker to make it one pic. thanks for posting the other pics im going to take a peak at them now. Thanks. I have been blessed to have friends who know 'the people'. I knew the late John Sawruk, Pontiac Historian. I have met his wife Marge and his kids. They are members of my POCI chapter. I have met Jim Wangers several times and I even challenged him about the 04-06 GTO TV ads after his lecture on GTO ads over the years. Arnie 'The Farmer' Beswick is another Pontiac racing legend I've met before. Other car people I know or have met are: Trixie Roth ('Big Daddy' Ed Roth's widow - creator of Rat Fink), Bill Hines - legendary car builder, Joe "Candy Apple Red' Bailon - he invented candy apple red paint, Gene Winfield, Chip Foose, Troy Trepanier, Darryl Starbird, George Barris, Mario Andretti, Linda Vaughan and Doc Watson (Hurst Shifters fame). They are legends all. I worked with Denny Manner of Buick engine fame. Most recently, my wife and I have made friends with The Reflections. They are members of the Rock and Roll Hall of Fame. Their big hit was "Just Like Romeo and Juliet" in 1964. They performed again at the Charleston WV car show a few weeks ago and we were able to hang out with them in the bar afterwards. All but one of them still live in the Detroit area. They are a great doo wop group. If you love 60s music, you will love their style. Dennis Gage from My Classic Car has autographed the glove box of the Lemans. That happened back in 2002 when my dad and I did Cruisin' The Coast in Biloxi Mississippi. I have been around 3 episodes that he has filmed, Cruisin' the Coast, Frankenmuth Autofest, and the Charleston Rod Run and Doo Wop. So with some luck perhaps I will get to meet other great car people in years to come. One thing is for sure. Car people are the some of the most charitiable and generous people I've ever met. So I would encourage everyone to join a local car club. Make some new friends, share some experiences, have some laughs together. You might be surprised to find out who they know!!! Looks great. The place is impressive. I would love to see the other 16 warehouses and buildings to be sure. Yeah, I have to agree that car people are some of the best I've ran into online and offline (minus a few ). Very glad that one of my addictions turned out to be cars lol. Awesome pics! Wish I could see some time. My dad, grandfather, roommate and I were lucky enough to visit the Heritage Center when we were at the Fiero 20th Anniversary show in 2008. This was obviously before a lot of the collection was sold at Barrett Jackson. We were lucky enough to see ten of the concept Fieros, including the 90 concept, 2+2 four seater, convertible, and the Huffaker race car. Click here to see my roommate's shots from that day. Ahh, you saw the Protosport 4! My grandfather worked on that project! It's hard to believe that this thread was started in 2011. Most of the posted pictures have been move/removed. Here is a Detroit Free Press article regarding the GM Heritage Collection. I have had the honor to have been there 4 times over the years. It is here where Mac McKellar personally told me his story about the OHC6's development. Enjoy.